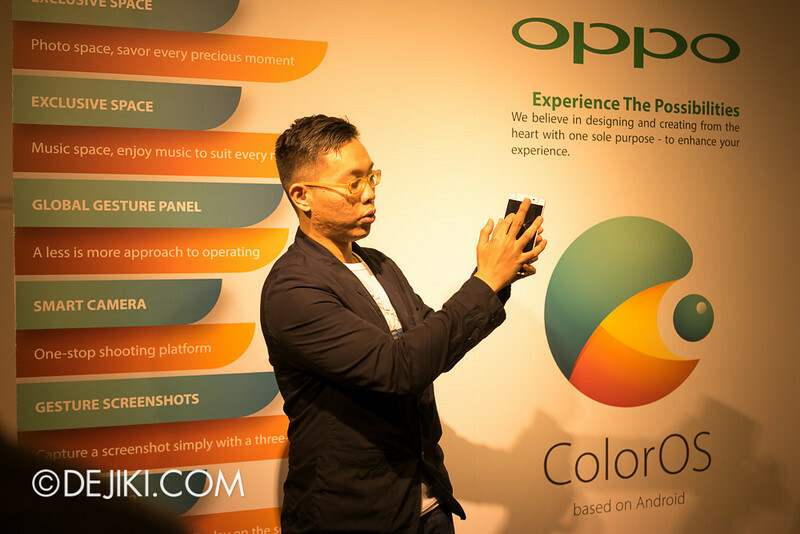 I attended media tour showcasing Oppo’s philosophy towards design and features of their smartphones. 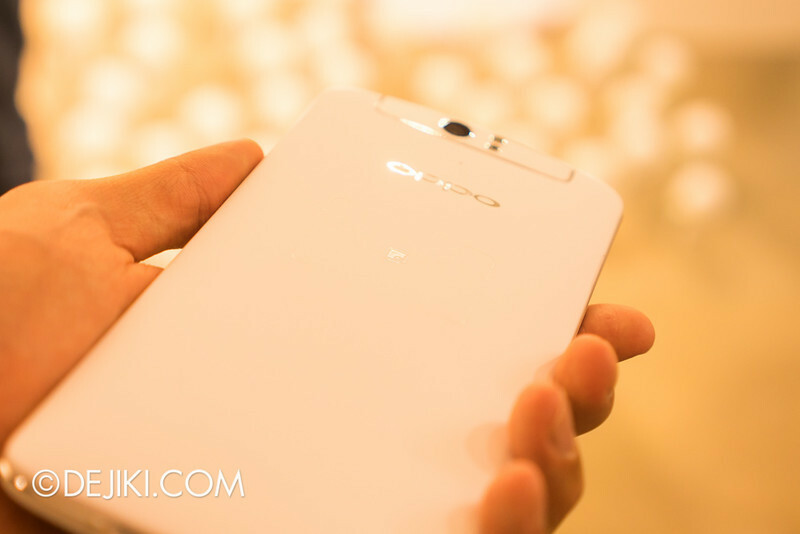 Throughout the tour, I had an Oppo N1 (shown in the photo above) to play with. The N1 is really large, with a 5.9″ display. The smartphone is 9mm thin and weighs 213g. Its plastic body is accented with an aluminum alloy frame. Despite that, the phone feels substantial, without the typical “hollow plastic” feel. I’m an iPhone user for 6+ years, but last year I switched to Android for about 7 months. The smartphones that I’ve used are Huawei P1 LTE and Samsung Galaxy S4. I’ve already gotten rid of the Galaxy S4 – it was too unstable and came with too many extraneous Samsung software that could not be removed (without risk of voiding warranty). The only thing I miss is the larger display and overall form factor. The Huawei P1 LTE is a budget device that only runs on 4.0.4. It is however, surprisingly A LOT more stable, so I kept it as my standby phone. 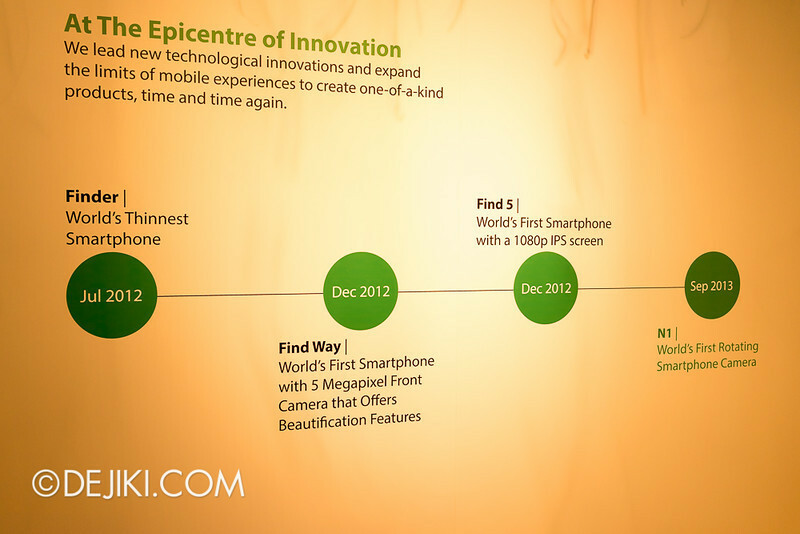 A timeline of Oppo smartphones. 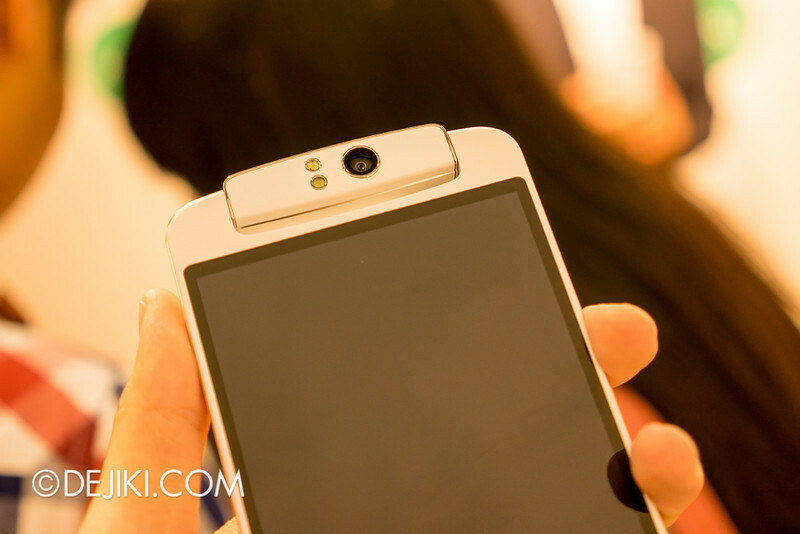 Oppo N1’s most defining feature is its swiveling camera. It can rotate from the back to face the front, plus at any angle between. It has a 13-megapixel sensor coupled with a six-element lens and f/2.0 aperture. Having used Sony’s NEX cameras for years, this behaviour is no stranger to me. It’s just the same, just that the screen is not tilting. The camera uses two LED for flash, and there’s also a diffused light mode when the camera is used for selfies. As I’ve said, the N1 is a big smartphone. It’s actually larger than the Samsung Galaxy Note 3. 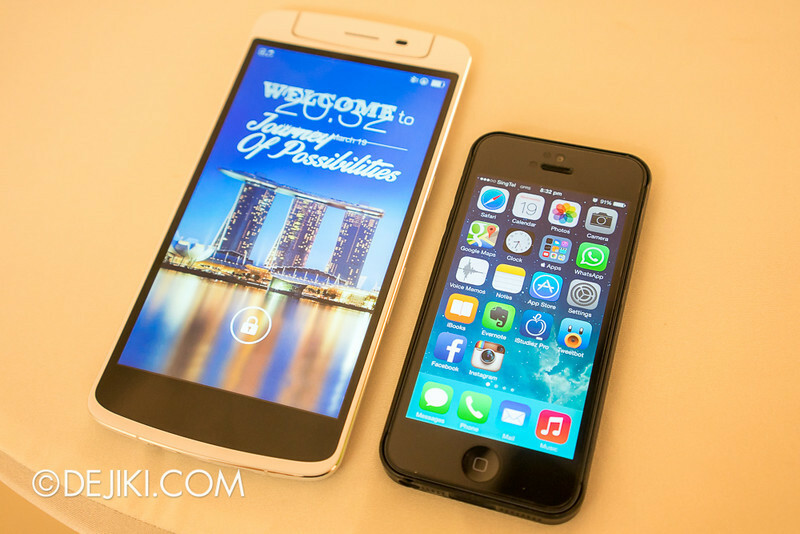 The screen is also larger than an iPhone 5. The display is an IPS panel with Full HD (1080p) resolution. It is very clear and vibrant, yet without the exaggerated colours (as seen in Samsung’s Super AMOLED displays). A small area at the back of the N1 can be used as a touch pad (called O-Touch) for simple gestures, such as swiping lists/screens and as a camera shutter button. Definitely useful for self-portrait photography! Each N1 smartphone also comes with a little keychain called O-Click, which is a little round button. It can be used as a remote shutter for the camera, or to “call” the N1 – you know, when you can’t find your phone in your (messy) room. 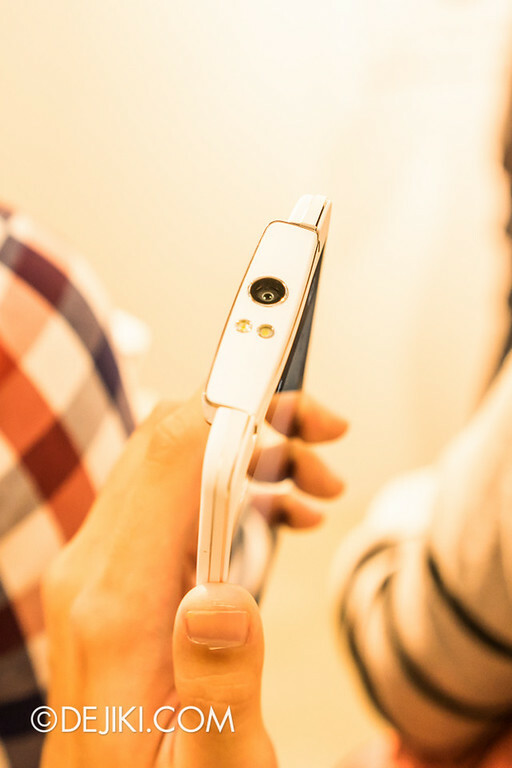 The O-Click uses Bluetooth Low energy (BLE). 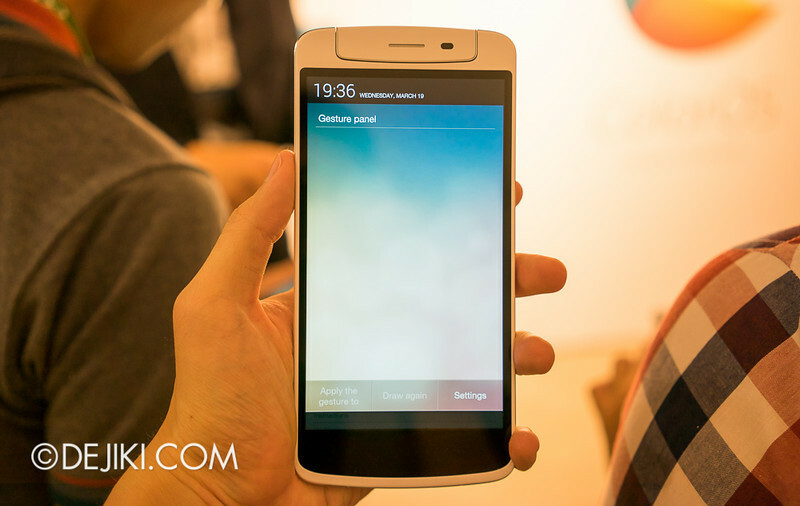 ColorOS is a custom Android OS created by Oppo, and they are certainly proud of its features and design. The current version is based on Android 4.2.2. The launcher has a Live Weather feature which brings visual effects on screen, based on location-based weather info (or you can manually set). Shown above is the “Snowy Weather” mode, where snow falls onto the screen’s elements. The visual effects work with the interface (with some level of physics), and reacts to touch gestures. Swipe to the right and you’ll find two dedicated spaces for Music and Photos. Here’s the music space, which mimics a DJ Deck. While there is definitely a mash-up of flat and skeumorphic aesthetics, I still appreciate the clean and simple interface in ColorOS. The fonts and colours are pleasing, and take good advantage of the beautiful display. However, the design team could’ve used a few more rounds of QA to polish the software. There are a handful of UI inconsistencies and oddly worded descriptions in the user interface. The music player can be controlled even when the N1 is on standby mode, with a few simple gestures. This is designed so that the user would not need to look at the screen at all, and control the player even when the N1 is in a pocket or bag. ColorOS comes installed with a handful of “Security Service” Apps (some features which users would usually have to get via 3rd-Party Apps from Google Play Store). So it has built-in functionality of Onova Extend, Permissions Manager, along with OS-wide hiding of content stored in the phone. Swipe down from one of the top corners of N1’s screen and you get this gesture panel. This is Oppo’s unique app switching method that bypasses the home screen/launcher. You can basically draw any gesture and set it to any App, or even use it for shortcuts like speed dial. The N1 certainly brings some impressive features and bold user experience. Other noteworthy items on its spec sheet include its massive 3610mAh battery (seems like the phone has enough juice for a day and a half), 1.7Ghz Snapdragon 600 Quadcore CPU (a norm but a goody) and a very clean and simple OS. And oh, there’s official CyanogenMod for the N1 as well, which gives you the benefits of the alternative OS, plus all of N1’s hardware features. I would miss two things: 4G/LTE connectivity and microSD slot. The N1 would have been the phone to have it all – and the one to give Android smartphone makers a wake-up call. 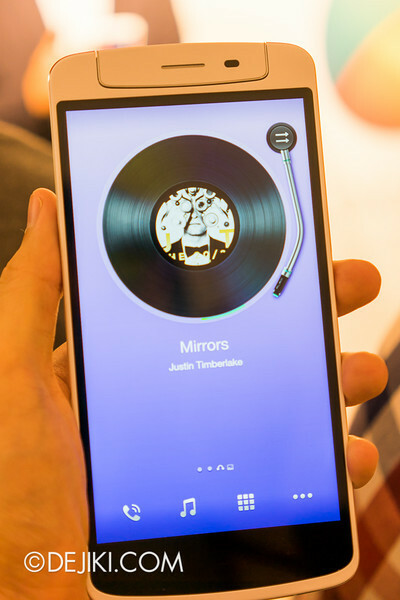 Oppo’s Find 7 (2014 flagship) seems to be the answer, so I’m definitely looking forward to that later this year. Who’s this? 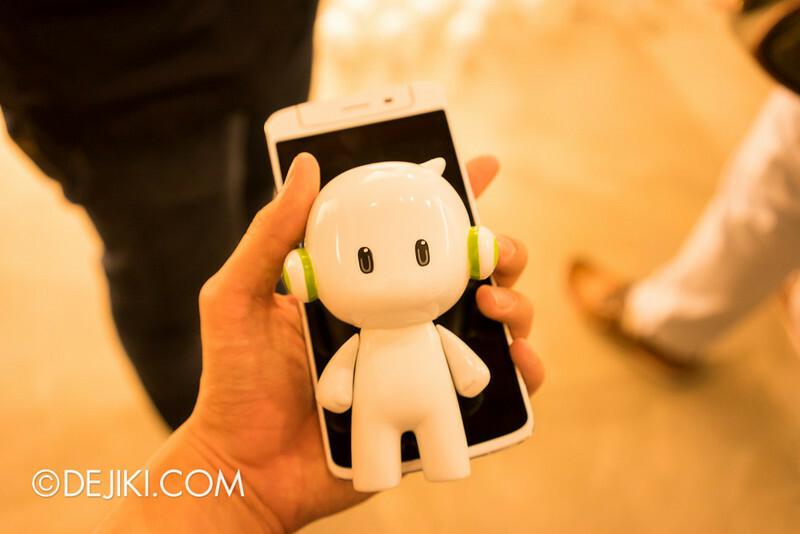 It’s Ollie – Oppo’s cute mascot character. 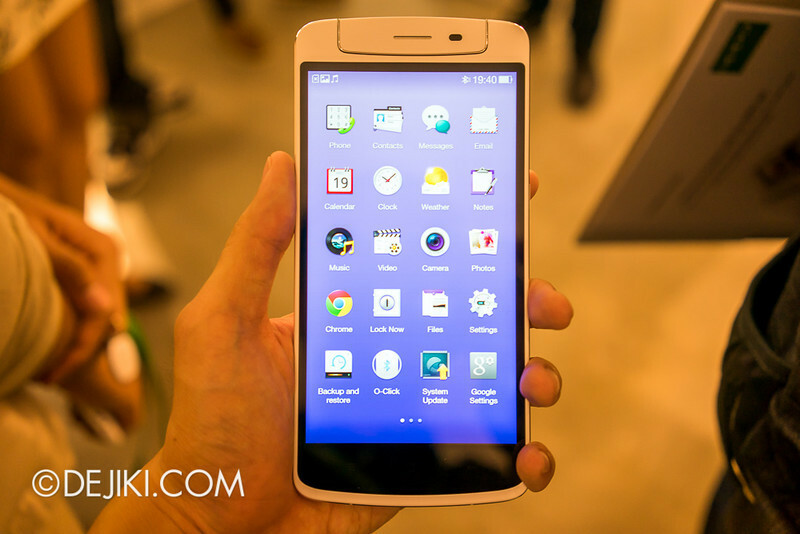 The Oppo N1 is now available for sale in Singapore at S$769 at authorized retailers. 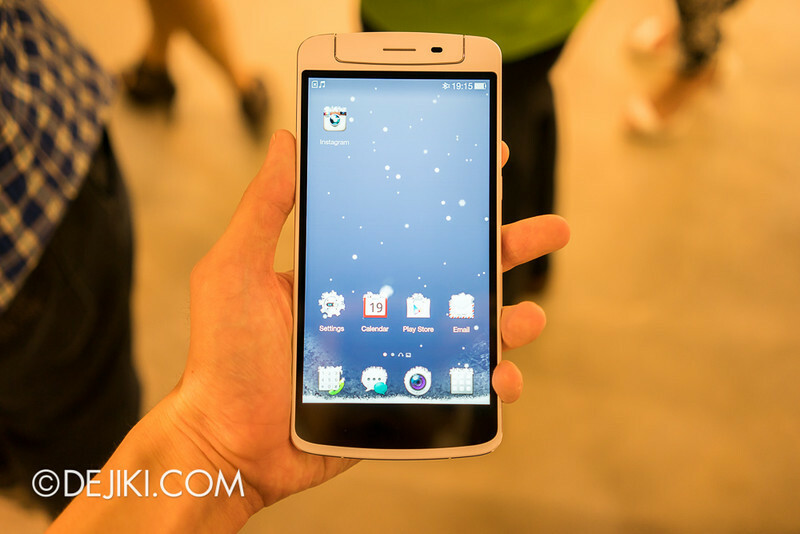 If you’re considering to buy, OPPO is offering something to sweeten the deal! 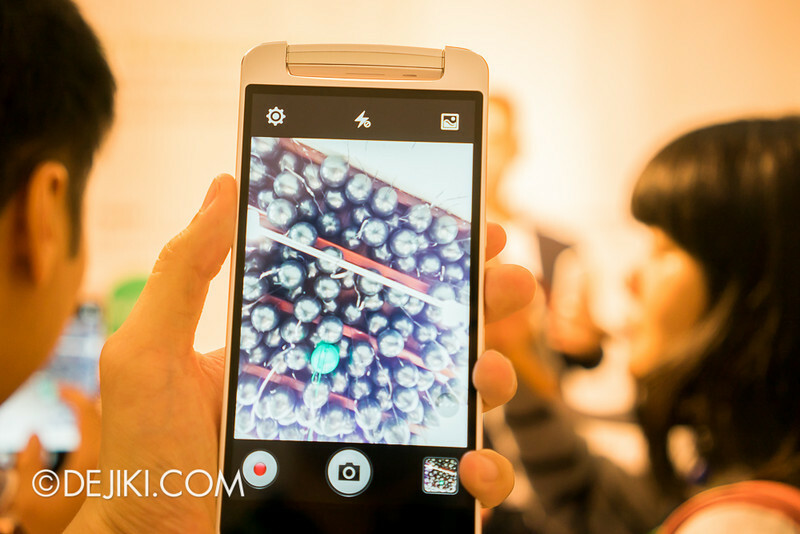 Contact OPPO via email (zr.lim@oppo.com.sg) with your name, contact details, and mention Dejiki.com. Oppo will surprise you with a special promotional price! 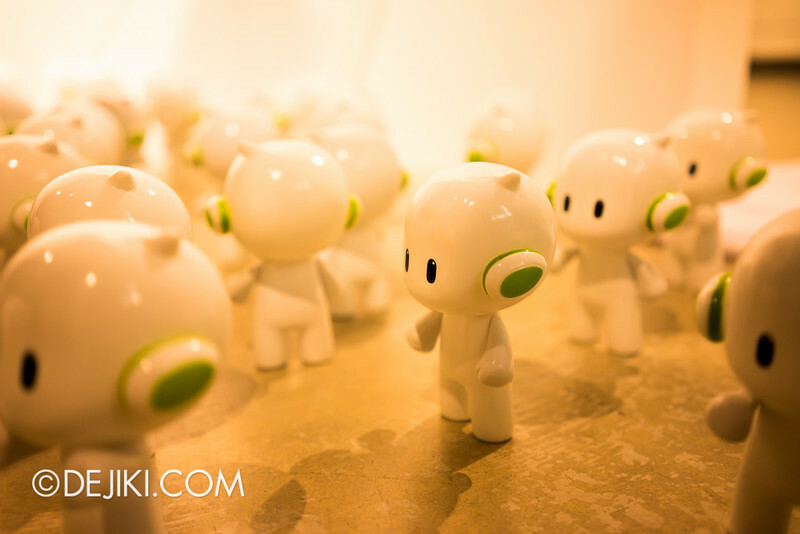 Thanks to Oppo and CROWD for inviting Dejiki.com to the Oppo N1 tour.